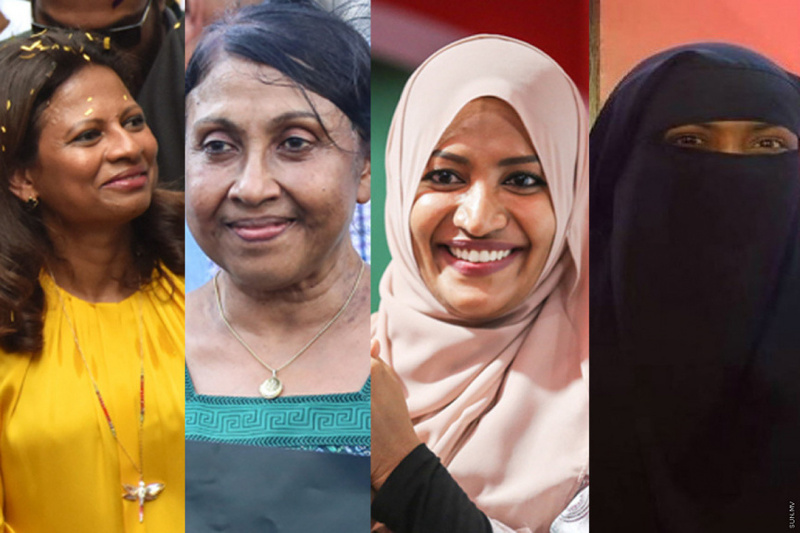 Combined file photos of (from L-R) Laila Ali, Nasreena Ibrahim, Aishath Nahula and Mariyam Reem. The past three years wasn’t easy for the four top opposition political leaders of Maldives. The campaign by Former Maldivian presidents Maumoon Abdul Gayoom and Mohamed Nasheed, as well leader of Jumhoory Party Qasim Ibrahim and leader of Adhaalath Party Imran Abdulla against the current Maldivian administration removed them from the loving arms of their spouses and family. Either to prison or self-exile. The situation changed with President-elect Ibrahim Mohamed Solih (Ibu)’s victory on September 23, 2018. Maumoon and Qasim were released on parole and later acquitted. The court ordered a delay in execution of the prison sentence against Nasheed and he returned home to Maldives after nearly three years in exile. And Imran was released from house arrest after the court ordered a delay in his prison sentence as well. Will the four top opposition politicians either in prison or in exile, their families took an active role in the oppositions activities at home in Maldives – especially their spouses. 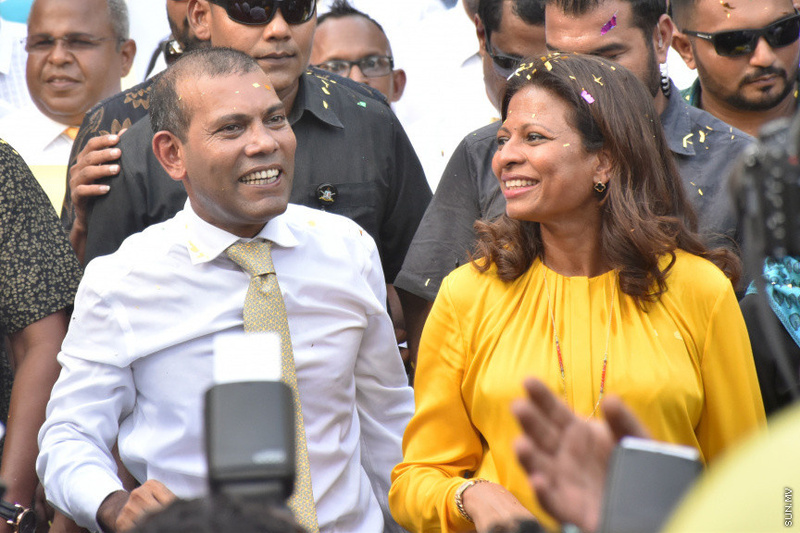 Nasheed was arrested in 2015 and sentenced to 13 years in prison after a questionable 19-day trial, spiking a long and hard battle by his wife, Laila Ali to secure her husband’s release. She travelled with Nasheed’s international attorneys Amal Clooney and Jared Genser, meeting with international leaders such as the US Secretary of State John Kerry and UK Prime Minister David Cameron to discuss her concerns regarding her husband’s trial and prison sentence. Nasheed returned to Maldives last Thursday after nearly three years in exile with his wife, Laila. On his way to Maldives, Nasheed tweeted a picture of the dragonfly pendant around his wife’s neck and captioned it with a verse. My dear dragonfly, escaped have you? Bored in your cage were you? 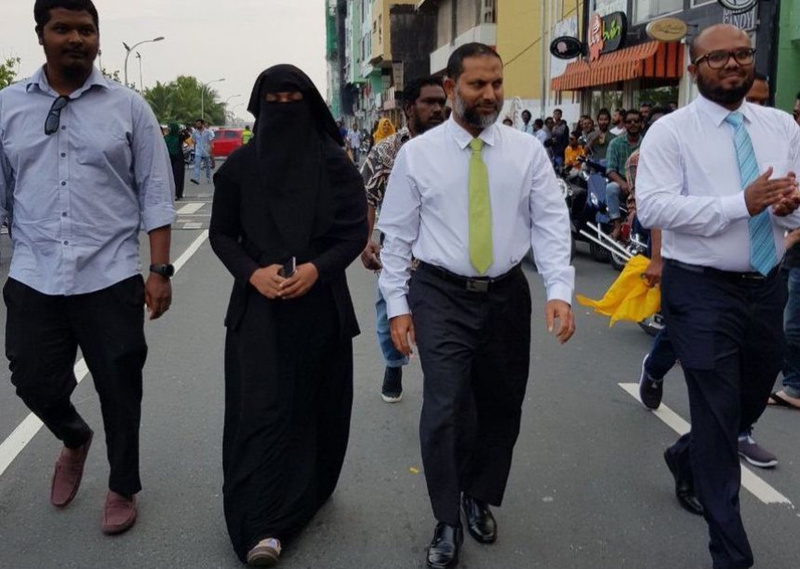 Nasheed took his first walk in Male’ City with Laila by his side. She was the first name on his thank you list when he addressed the crowd gathered to welcome him back. A difference of opinion led to a rift between Maumoon and then-leader of Progressive Party of Maldives (PPM) and his half-brother – the Maldivian President Abdulla Yameen Abdul Gayoom in 2016. 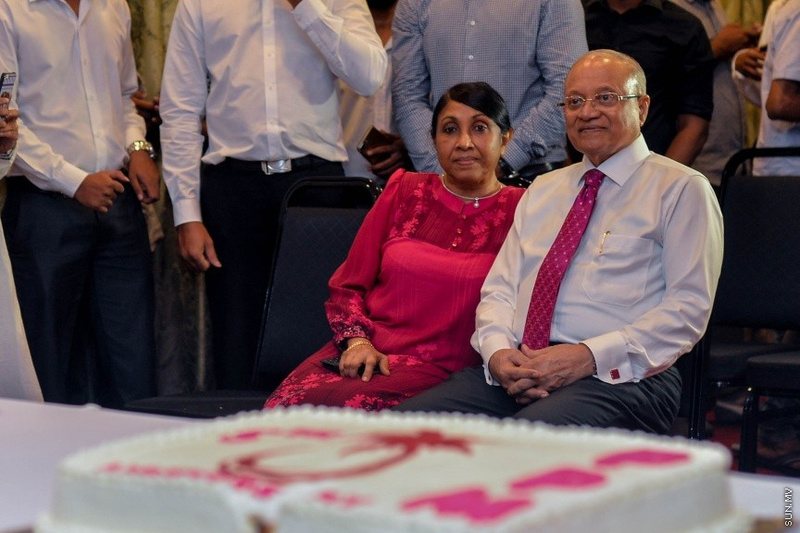 They soon parted ways and Maumoon joined the opposition’s campaign against Yameen’s administration. Maumoon was arrested for investigation into the Supreme Court’s order on February 1 – which called for the release of all political prisoners – and sentenced to one year, seven months and six days in prison after he refused to surrender his phone to the police. Maumoon was released on parole on September 30. And acquitted, not long afterwards. He publicly expressed his love for his wife, Nasreena Ibrahim in a tweet, moments after his acquittal. Praising the former First Lady for her courage and loyalty. Nasreena showed up to every single court hearing since her husband’s detention. If only for a glimpse of her husband. Nasreena acted as proxy for Maumoon during Ibu’s presidential campaign, even travelling to Addu City for the opposition’s last campaign activity. She also recorded and publicized video messaged asking the public to vote for Ibu. Leader of Jumhoory Party and lawmaker Qasim was found guilty of bribing fellow lawmakers and sentenced to three years, two months and 12 days in prison in 2016. The State granted him permission to travel abroad for medical treatment and Qasim obtained asylum from Germany and refused to return to Maldives. His wife, Aishath Nahula (Aisha) took a more prominent political role to make up for her husband’s absence in Maldives. 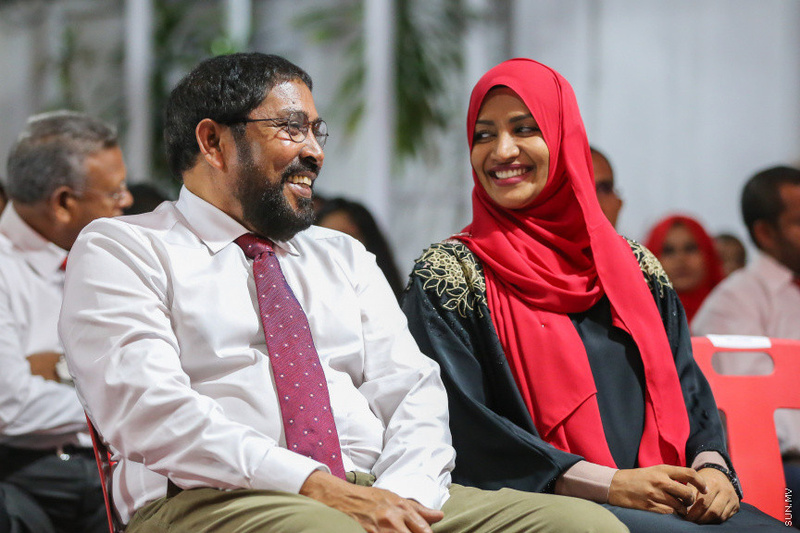 Aisha took a prominent role in JP’s activities and traveled to some 60 islands on campaign trips to gather support for Ibu and his running mate, Faisal Naseem. Qasim returned to Maldives last October after the court granted him parole. During the first press conference after his return, Qasim thanked Aisha, who is the mother of his six youngest children. Leader of Adhaalath Party, Sheikh Imran was the last to be freed out of the four political leaders. Sentenced to 12 years in prison for terrorism, the court ordered a delay in execution of Imran’s prison sentence last Thursday, freeing him from house arrest. His first act of freedom was to take him wife Mariyam Reem out to welcome Nasheed back to Maldives. Reem took an active role in politics after her husband’s arrest. She joined forces with wives of other jailed politicians and publicly criticized Yameen’s administration. Every single day of the past 42 months had been a really tough struggle for us, but you proved yourself to be one of the strongest of all women. I cannot thank & love you enough. You crossed oceans & moved mountains for me. Imran took to Twitter to thank his wife, Reem. He described Reem as one of the strongest women ever, and said he was forever indebted to her.